Many public services on the Isle of Wight will be unavailable during the festive period, the council has warned. The Help Centres in Ryde, Sandown and at County Hall are closed Christmas Day until 4 January. The Revenue and Benefits department is also shut. The highways service is offering a helpline number for emergencies and has asked people to leave a message about non-urgent matters. The Wightbus has advised it will be running a revised timetable. A council spokesman said: "There will be no services on December 25 to 28 and January 1 to 3. 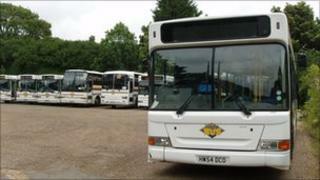 A revised Wightbus timetable and service will be in operation." He advised people to contact their local libraries, leisure centres and entertainment venues for opening times during the Christmas period. Emergency numbers for council buildings, housing services, highways and adult social care are available via the council's website.